This is a pile of Lovie Dolls my bible study group made last weekend for our Threads of Love chapter. 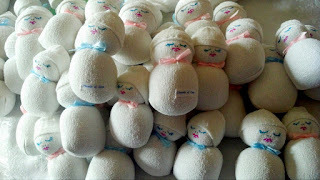 Lovie Dolls are donated to local hospitals to be given in pairs to preemie baby and his/her mommy. They each sleep with one doll. Then they swap them out. When baby picks up mommy's scent from her doll, it is calming and reassuring that mommy is near. When mommy picks up baby's scent, it helps bring her milk in. Isn't that just a God thing? I am amazed every time I think about it when we make these dolls. We managed to get 30 pair completed. Each of our local hospitals wants 50 pair every month! They were very excited about these little guys. To find out more about Threads of Love and/or how you can help, visit the national website or send me an email. Hi Sara, aren't they wonderful? We have gotten such positive feedback on these and all the items TOL has donated. It's a great ministry. Have fun making yours.